Spine surgeries are some of the trickiest and challenging types of surgeries. The variations in the anatomy as well as the bone quality of the patient, appropriately taken and good quality X-rays and the chances of human error, along with the vitality of an organ like Spinal Cord and the associated nerves, can bring along or translate into serious complications. Therefore, the introduction of advanced methodologies to lower the risks and to enhance the accuracy levels, plays a significant role. In this scenario, sophisticated surgeries like Robotic Spine surgery can be enormously rewarding. India has very well adopted these surgical techniques and the top Robotic Spine surgeons in India are highly favoured for the proficiency with which they are handling such surgeries. Firstly, the patient’s CT scan is in the system to get a 3D view of the problem area. After this a mounting platform is selected and four platforms are attached to the patient’s spine. Then comes the three-dimensional sync matching, which gives the surgeons very minute details of the surgical site and ensures maximum correctness. Once the above steps and done, the surgeons then select affected vertebrae. Then the software displays the section, where the guidance unit has to be attached. Then the pre-planned surgery plan is sent to the guidance unit, which helps the surgeon to proceed further. This whole process goes on till all the implants are properly positioned. How is Robotic Spine Surgery helpful? Scoliosis – This is a neuro-muscular condition that usually affects children in the age group of 10-14. In this, a curve occurs at varied points of the Spine from 15 degree or more than 50 degrees. Degenerative Disc Disease – It is one of the most common causes behind neck pain or low back pain. This happens due to wearing or tearing of a Spinal disc and can lead to numbness and severe extreme pain in the legs or arms too. Herniated Disc – When the discs in the Spine start degenerating due to the natural ageing process or some kind of injury, the soft portion found in the centre of the disc can rupture or herniated. Kyphosis – It can attack an individual belonging to any age group or gender. It mostly damages the upper back and can also affect the Cervical Spine area or the Lumbar Spine section. Spondylolisthesis – This is an ailment in which the bone in the patient’s back (vertebra) slides and moves on top of the bone below it. This generally happens in the lower spine that is the lumbosacral portion. In some cases, it may also lead to the Spinal Cord or the nerve roots getting squeezed. This brings along extreme kind of back pain, numbness or weakness in one or both the legs. Also, in some rare cases, it can also lead to the patient losing control over bladder or bowels. The more advanced the medical field gets, the more it becomes burdening for the patients across the world to bear the expenditure of the different treatments and surgeries. The usage of Robotics in the field of medicine is one of the most progressive forms of treatment that has proved beneficial for several patients owing to the massive amount of benefits. Thus, more and more patients are opting for it; however the cost can be a major obstacle in this matter. But international patients are finding India majorly advantageous because of the possibility of low cost Robotic Spine Surgery in India. 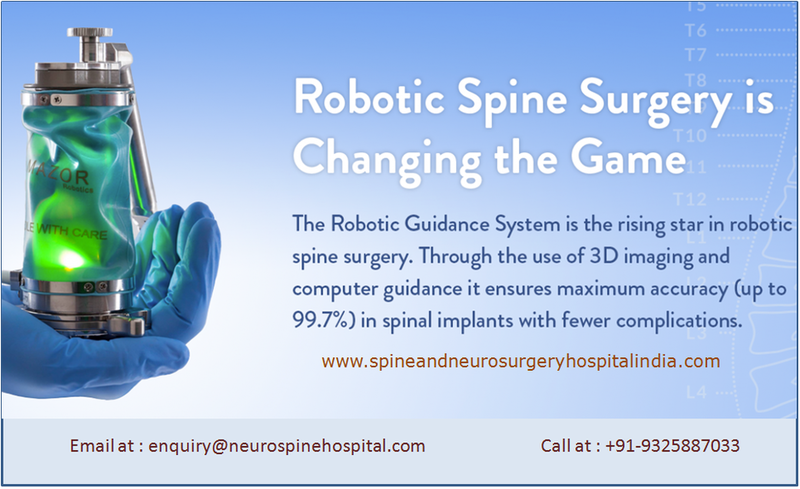 The best hospitals for Robotic spine Surgery in Mumbai and Chennai are offering this procedure at very cost effective prices. While the medical tourists are in India for Robotic Spine Surgery, they will obviously prefer to get the surgery done by the top Robotic Spine surgeons in India. So that they can avail the associated services easily, Spine and Neurosurgery Hospital India can assist these patients in a very well planned way. Therefore, please contact us so that we can arrange and schedule the initial consultation at the earliest to help you get rid of the painful Spinal disorders.